work 2dc in next sc, yo pull through 3 loops. With color 1 ch100, making sure you do not twist the chain length, sl st to first chain to make a ring. Row 2 - ch1, 1sc in base of ch1, * ch5, skip 3sc, 1sc in next sc, * rpt from * to * to last 3sc, ch5, skip 3sc, sl st to first sc on beginning of row. Turn. Row 3 - ch3, 1dc in base of ch3, * ch2, 1sc in 5ch space, ch2, dc2tog (see abbrev) in next sc, * rpt from * to * to last 5ch space, ch2, 1sc in 5ch space, ch2, sl st to top of ch3 on beginning of row. Turn. Row 4 - ch1, 1sc in base of ch1, * ch5, skip (ch2, sc and ch2), 1sc in top of next dc2tog, * rpt from * to * to last (ch2, sc and ch2), ch5, skip (ch2, sc and ch2), sl st to first sc on beginning of row. Turn. Row 5 - ch3, 1dc in base of ch3, * ch2, 1sc in 5ch space, ch2, dc2tog in next sc, * rpt from * to * to last 5ch space, ch2, 1sc in 5ch space, ch2, sl st to top of ch3 on beginning of row. Turn. Fasten off. Join in color 2 and rpt Rows 4 & 5 three more times. Fasten off. Join in color 1 and rpt Rows 4 & 5 twice. Turn. Row 16 - ch1, 1sc in base of ch1, * ch3, skip (ch2, sc and ch2), 1sc in top of next dc2tog, * rpt from * to * to last (ch2, sc and ch2), ch3, skip (ch2, sc and ch2), sl st to first sc on beginning of row. Turn. Border - Join in color 2, ch1, 3sc in base of ch1, * skip 2sc, 3sc in next sc, * rpt from * to * to last 3sc, skip 3sc, sl st to first sc. Fasten off. Rpt Border in color 2 around cast on edge to match first side. Fasten off. 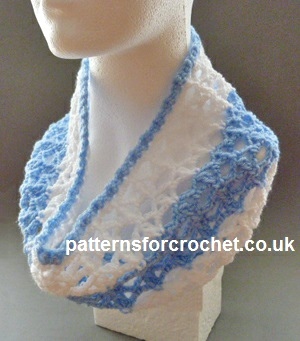 Hope you enjoy this free crochet pattern for a lacy cowl.